Art can be so much more than just a pretty picture. It can transform environments and win over hearts and minds, says UFV Visual Arts professor Chris Friesen. Students from Friesen’s UFV’s Community Arts Practice class took on the daunting task of transforming some unattractive spaces into warm and welcoming spots on the Abbotsford and Chilliwack campuses this summer. The largest was a vast grey concrete wall in what used to be an RCMP firing range on the Chilliwack campus at Canada Education Park. 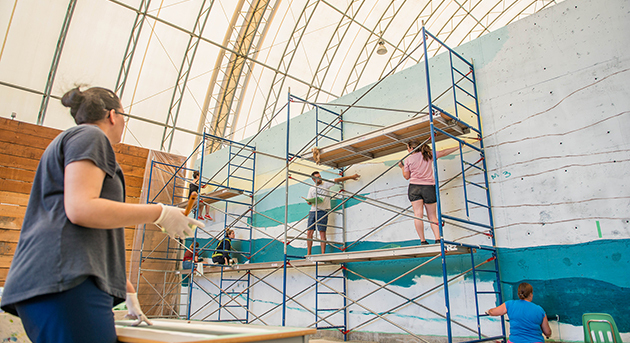 When the RCMP lease on UFV land expired in 2016, the university’s Campus Recreation department began to transform the vast Quonset hut into a recreational space for drop-in basketball, hockey, and perhaps wall climbing in the future. 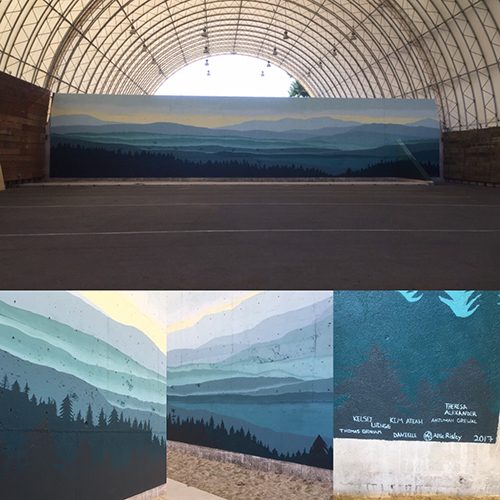 “The students took a bleak, grey wall and turned it into a community space by painting an airy mountain scene, evoking the views of the mountains all around the campus, a very familiar Fraser Valley motif,” says Friesen. 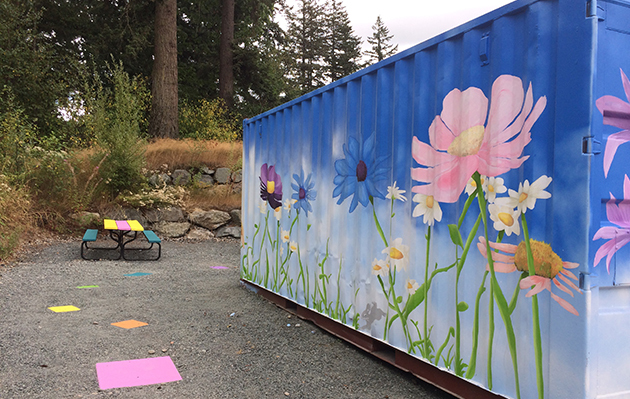 The other project was a grouping of shipping containers used for storage on the Abbotsford campus near Building C.
“They turned that into a community space by painting the containers in bright, colourful flowery images that enlivened the environment around it. We even brought a picnic table in and created a gathering spot in what had been an uninviting, desolate space. We’re calling it the Oasis,” Friesen says. The students don’t just paint the murals. They work in competing groups to pitch the client (in this case, UFV) on approaches to take to the project. They then work together to complete the concept that the client chooses. The students provide the labour, gaining valuable experience, and the client pays for supplies. Mark Goudsblom, UFV facilities director, was happy to liaise with students on the projects and serve as part of the jury that selected which projects to proceed with. The Community Arts Practice course has been offered since 2004 in the summer semester. Past projects have been completed with partners such as the Mission School District (three consecutive summers) and the Abbotsford Recreation department (creating public art at MSA and ARC recreation centres). “I don’t know of any other university art program that offers students this public art opportunity,” says Friesen, noting that it ties in well with UFV’s commitment to community outreach and partnerships.